Rolling Stone cover art from issue 731, April 4, 1996 printed on vinyl. 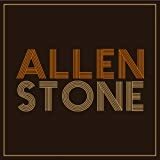 From backwoods barbecues and community gatherings, Allen Stone emerges to share personal melodies, telling his tales of life after just 24 years. Originally getting his start singing at his father s church in small-town America, Stone s intense passion for music was instantly ignited by the greats of soul music (Marvin Gaye, Aretha Franklin) and eventually by the confessional lyrical fashion of the 60’s -70’s singer/songwriters.